Make your mantel beautiful by decorating it with a set of these amazing DIY Christmas stockings! 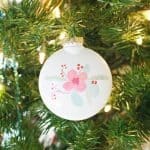 These 20 ideas are so festive. We talked about 16 ways to make a Christmas tree skirt, and now I’m ready to dive into another fun holiday decor staple: DIY Christmas stockings! I have very fond memories of hanging up stockings when I was little. It was always my job to do it, and our grandmother had given us knitted stockings with all of our names on them (so they were very special). Given that I had four younger brothers and thought that the way to get more stuff in your stocking was to have the biggest one, I got creative each year. spent a lot of time stretching my knitted stocking. If you look at old pictures, you can see each year that the toe got a little longer . . . and longer . . and dangled down below the others. Hilarious! Now that I’m older, it’s time to make my own stockings. I put together a collection of 20 DIY Christmas stockings that inspired me. You can bet that mine will be the biggest one of any that I make . . . I haven’t given up on the idea that you get more if your stocking is bigger. 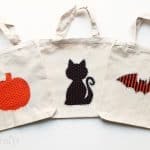 Scroll down to see the projects I found! Make a stocking out of an old cable knit sweater, then add a pretty white poinsettia to top it off. Using felt is a pretty (and inexpensive) way to make simple stockings. You can make this stocking the night before – by picking clip art or even cookie cutter shapes. Johnnie created these cute stockings out of towels – you can also use a drop cloth. Don’t throw those coffee bags away – turn them into vintage inspired stockings. Don’t throw away those pants . 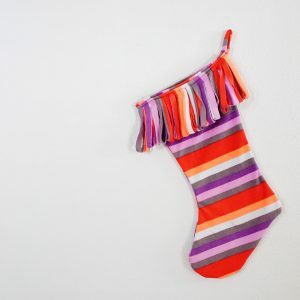 . . turn them into a colorful stocking with your sewing machine! I love the felt botanical patterns added to the front of these pretty stockings. This classic DIY Christmas stocking pattern will look great with any type of fabric – and of course you have to add the pom poms. If you love midcentury as much as I do, this inspired stocking will be right up your alley. If you aren’t comfortable with sewing linings, this tutorial shows you a simple way to do it. If you love polka dots as much as I do, these colorful burlap DIY Christmas stockings will definitely tickle your fancy. This little guy lost part of his head! And looks really cute on the front of a stocking. Jamie made these sweet stockings using her grandmother’s old dresses – don’t you just love the toes? 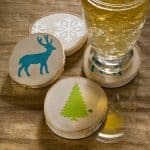 These are made of wood so they don’t hold anything – but they look REALLY cool on a mantel! I love the beautiful color palettes of these stockings, and the pretty embroidery. Feeling a little retro? These space age stockings are amazing. Chelsea used a plain red stocking and personalized it with scalloped trim and an embroidered name. For a budget stocking option that looks great on the fireplace, use thrift store sweaters. 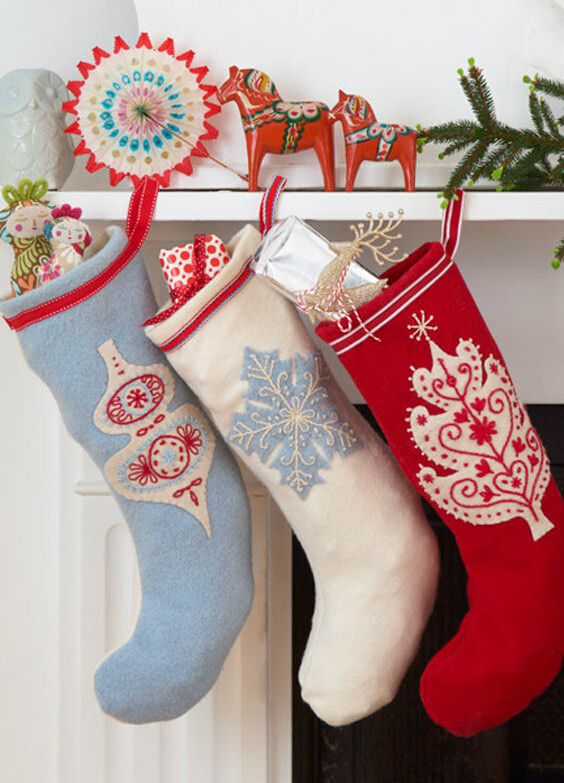 Get the easy way to make a cute stocking, complete with pom pom trim.